As a published (presumably) Roll of Honour this listing does not qualify as a War Memorial by the definition of the Imperial War Museum, however it provides invaluable information for research in the Wombwell and wider Barnsley area. Photocopies of these pages were found in a folder held by the Friends of Wombwell Cemetery. Only one man is noted as killed, Arthur Utley of the KOYLI, on 16th October 1914. From this we assume the list of those on Active Service must date from not much later than that. Note that on the Commonwealth War Graves Commission entry for Arthur his date of death is given as 24 October 1914. He has no known grave and is remembered on Le Touret Memorial in France. Two nurses are listed on this document - Miss F A Cropper and Miss M Booth. 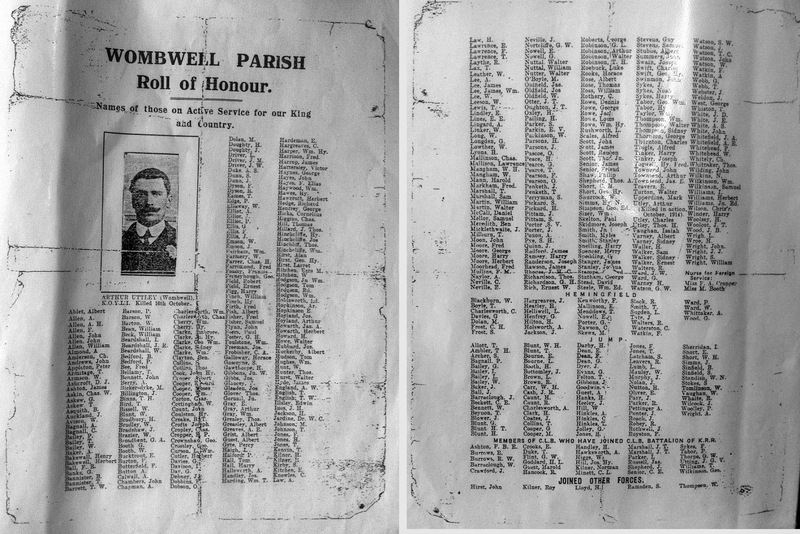 A transcribed list of all the 607 names on this Roll of Honour can be downloaded here in .pdf format.